Panda Security achieved the highest protection ratios in the Real World-Protection Tests conducted by AV- Comparatives in March, April, May and June 2015. This test evaluates the real-life protection capabilities of antivirus software. Panda Security’s antivirus solution, detected and blocked 99.9% of all threats. In simple terms, the test framework replicates the scenario of an everyday user in an everyday online environment, testing antivirus software products against malicious Internet downloads or exploits designed to infect computers automatically by taking advantage of system vulnerabilities. The study, which analysed more than 20 antivirus solutions, reinforce the great protection capabilities of Panda Security’s product. Here at Panda we are very pleased with the latest AV Comparatives and AV Test results, these results see our products offering the highest level of protection. From March to June 2014, thousands of ‘real world’ proactive detection tests were done by AV-Comparatives. The results show that our anti-malware engine detected and blocked 99.9% of threats. AV-Test also conducted a ‘real world’ detection test in which we achieved the highest score and we have also been rated #1 in the ‘false-alarm’ or ‘false positive” test. The tests compared products that use the new XMT (Extreme Malware Terminator) Smart Engineering engine. With XMT, different technologies interact with each other to achieve new levels of efficiency, detection and disinfection power. The XMT engine is included in our new 2015 consumer product line. These tests are evidence of our superior detection technology. Panda Security has announced the launch of version 2.0 of its popular cloud-based consumer antivirus service Panda Cloud Antivirus, both for its Free and Pro Editions. This new version is fully compatible with Windows 8 Release Preview and incorporates a new smart community-based firewall and many other improvements. Since its initial release in 2009, millions of users around the world have benefitted from award-winning free antivirus protection and minimal resource consumption that Panda Cloud Antivirus provides via its Collective Intelligence technology. Thanks to a new cloud-based disinfection engine, Panda Cloud Antivirus 2.0 offers even better malware detection and disinfection capabilities, as proven by tests conducted by renowned independent laboratories such as AV-Test.org and AV Comparatives. Panda Cloud Antivirus Free Edition optimizes security by adding behaviour-based scanning technologies, a feature previously only available in the Pro Edition. Panda Cloud Antivirus 2.0 incorporates a series of improvements aimed at defending users against an increasingly sophisticated and diverse set of threats such as rogueware and ransomware; neutralizing malware capable of getting past antivirus programs; and adapting its scanning techniques and sensitivity to the risk posed by each malicious item. Panda Cloud Antivirus 2.0 removes all malware traces after neutralization it has a lower impact on system performance, and scans more than 50% faster than earlier versions of the program in on-demand scans. 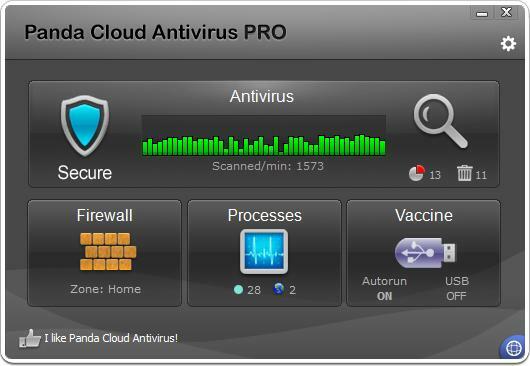 Panda Cloud Antivirus Pro Edition includes all the features of the Free Edition plus a new smart community-based firewall that automatically stops intrusion attempts and data leakage. In line with the product’s philosophy, the firewall minimizes user intervention by automatically managing application permissions based on the real-time knowledge gathered from Panda Security’s global user community. The new firewall incorporates an intrusion detection system and adapts its behaviour based on the network type the user is connected to (home, work, public place). In addition, the Pro Edition includes 24×7 technical support and automatic USB vaccination against infections with auto run-based malware for R369.00. Existing Panda Cloud Antivirus users will be automatically upgraded to version 2.0.